Tickets $30/person, $60/family, get them from me (shukong@gmail.com) or at the door. Joan is going on the fifth medical mission to Leogane, Haiti sponsored by a local church, the Parish of the Epiphany in February, 2016. The team of 17 volunteers will stay at the Hopital Ste Croix which organizes mobile medical clinics in rural villages near Leogane. The team will bring medical care, dental care, medication and hope to very poor Haitians. Last year we saw more than 1200 patients and filled over 5000 prescriptions, which was a record. Besides the prescribed medications, each patient receives a toothbrush and toothpaste and a 3 month supply of vitamins. We also gave out hundreds of pairs of reading glasses. Please visit our website at http://www.mobilemissionhaiti.org/ for more information and access to the blog entries from previous years. We would deeply appreciate any financial help you can give. Apart from the money paid to Hopital St Croix for our room and board, we provide a much needed week of paid employment to a Haitian doctor, dentist, nurse, 12 translators and 2-3 drivers. We also need to raise almost $10,000 to buy all the medications that we take with us to Haiti to supply our clinics. Donations are tax deductable and you can be assured that your gift is going to Haiti to directly help the people there. You can donate by check or on-line. Checks: please make the check out to “Parish of the Epiphany” and write “Haiti Medical Mission” in the memo line. 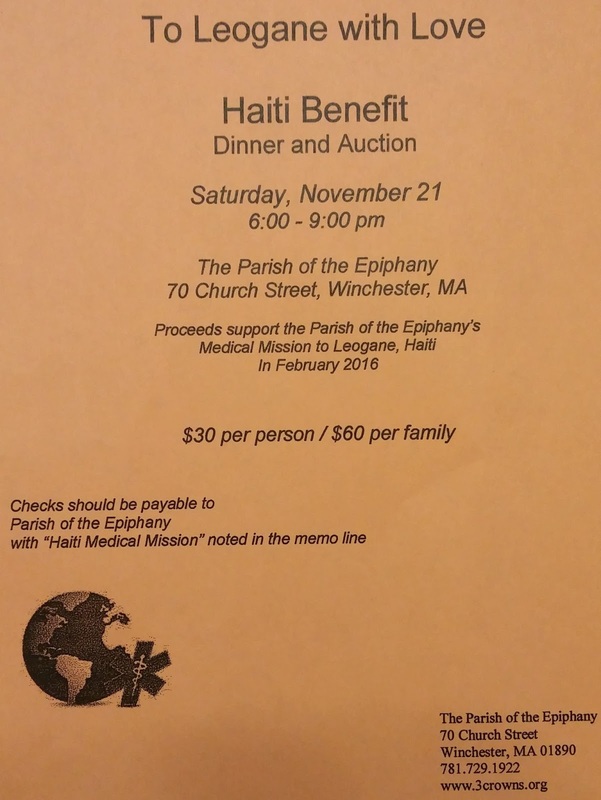 Checks can be sent to me at 4 Summit Ave, Winchester, MA 01890 or directly to Parish of the Epiphany at 70 Church St, Winchester, MA 01890. On-line: go to our website http://www.mobilemissionhaiti.org/ and click on the Donate Now button. On the first page, enter the amount of your donation and select the Haiti Medical Fund. You will be asked to enter your billing information on the next page and will receive an email receipt after you submit the donation. Life is slowly improving in Haiti. Let us share our blessings, care and help with these beautiful people. Thank you so much for your gifts in the past and your consideration this year.